What a great idea the International Ski Federation had by introducing the World Snow Day to encourage children to enjoy winter outdoor activities in the snow. The Candidature Committee for Cortina’s 2017 World Ski Championships bid was enthusiastic right from the beginning about this initiative. The participants at the Cortina’s WSD were blessed with a beautiful winter day with bright sunshine and not overly cold temperatures. Early in the morning 500 kids with their parents or ski instructors donned their World Snow Day bibs and took part eagerly in the various activities provided, both educational and recreational. A free bus service served 10 different locations and skis or snowboards were rent free of charge for the occasion, with ski instructors, friendly Firemen or Carabinieri on hand to accompany children or provide information. The ski-pass office offered day passes for 13 Euros to the few little skiers who didn't already have a ski pass. For the smallest children the kinder garden organized a snowman contest providing colourful clothes and gadgets to decorate the children's snow creations and their enthusiasm resulted in a bright gallery of snow sculptures for all to ENJOY. After that there was a Baby Dance to add to the merriment. From the Main Area the first location was a safety course to teach the basic principles of safety on the slopes. A huge banner showed cartoons explaining the rules. The course was full of bumps and obstacles with various danger signs that we come across often when skiing. From there either by bus or chairlift the kids moved on to the next station, an EXPERIENCE area which offered free cross country equipment and lessons, snowshoes and a thrilling ride on a pulley from a tree down the 80 meter snow cat winch cable to the snow cat. The kids loved that! The Dolomite UNESCO Foundation stand added to the fun letting the kids EXPLORE examples of fossils and dinosaur foot prints showing how the Dolomites were once a warm marsh area in ancient times. They gave out dinosaur print shaped snowshoes and the kids left dinosaur foot prints all over the cross country course. What a laugh! A little higher up the next station prepared a spectacular avalanche area where the children could see the avalanche rescue team in action! A ski patrol was hidden in a cave under the snow and the kids were all astonished at how quickly the rescue dogs were able to find him, barking and scraping at the snow. They all enjoyed playing with the dogs. They also had the experience of using an avalanche probe stick and tried to guess what they could feel buried under the snow. The curious answers offered when they felt a ski boot, a rucksack or a jacket amused us all. Forest rangers presented a program on avalanche avoidance. They showed kids how they study the composition of the snow with a magnifying glass. They could see the different types of crystals and the various layers of snow that accumulate on the mountain with every snow fall. The kids were given the chance to get into a rescue toboggan and look at the equipment in an ambulance. The White Cross of Cortina d'Ampezzo taught them how to make an emergency call correctly and how to help someone who has been injured. The lift company made three snow cats available for visits and the kids were all fascinated as they climbed into the control cabin. A snow canon was also part of the exhibition, showing the amazing process in which water pumped into them results in a mound of artificial snow to be spread on the slopes where snow is scarce. The local recycling company provided an activity area where kids could play with colourful blocks that stick together when wet, all made from recycled materials. The resulting compositions were beautiful and the kids were all proud of their creations. They also learned the importance of recycling and how it helps to keep our environment clean. For lunch all the restaurants in the area offered a sandwich and a soft drink at a special price for kids with the World Snow Day bib on. 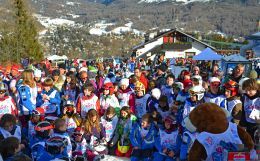 Towards the end of the day excitement rose as the organisers prepared a draw for the 10 lucky kids who would win a helicopter trip over Cortina d’Ampezzo and the surrounding mountains. The winners jumped on a ski-doo and were taxied to the bright red helicopter. The whole crowd watched the take off and landings and the kids in the helicopter could see all the colourful bibs brightening up the slopes as they flew over the area. The wonder and excitement in their eyes as they left the landing area were contagious and the whole crowd ended the day on a happy note with a free hot chocolate for everybody. Parents were all as enthusiastic as their kids and hope that this fun program can be organised every year. One father said: "What a wonderful initiative! We had such fun together with all the family on the snow!" The pictures and the video show the enthusiasm and joy that pervaded World Snow Day better than words can. 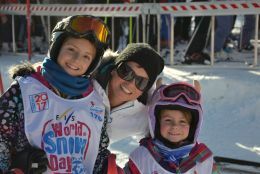 Happy Family at World Snow Day! Final Draw for an Helicopter flight over the Dolomites!